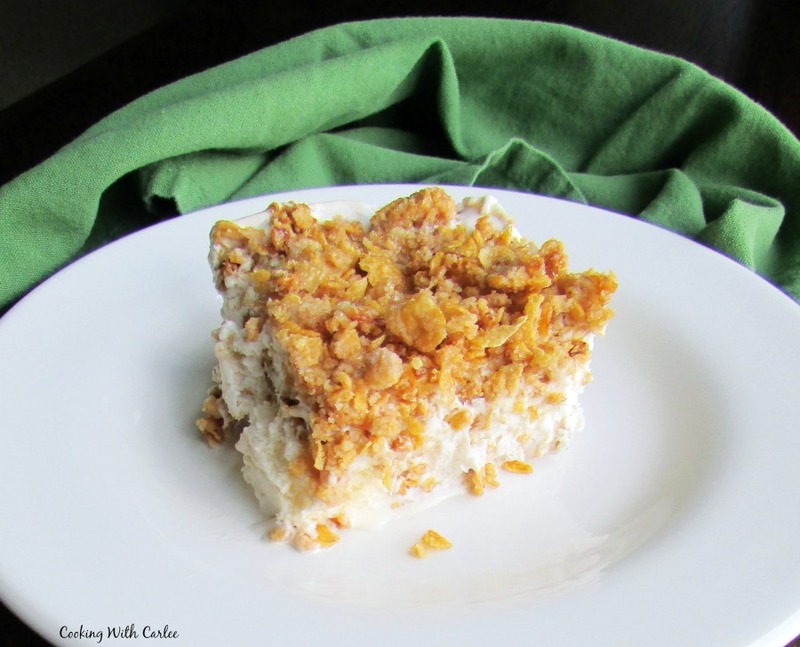 All of the fried ice cream flavor without the mess and a great make ahead too! Perfect for Cinco de Mayo, potlucks and BBQs too! 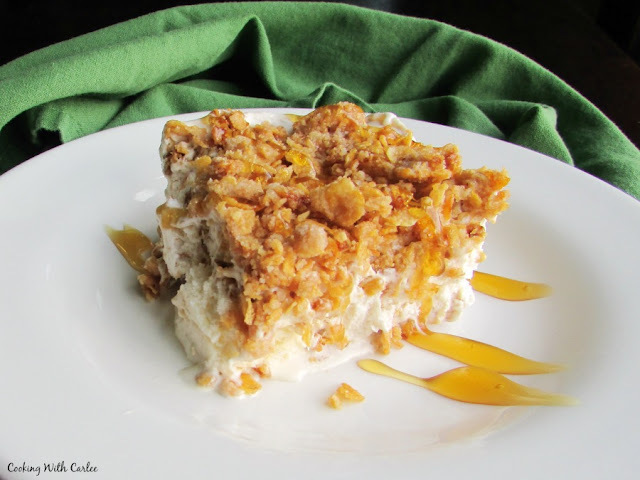 I actually first posted this recipe a couple of years ago when the blog was in its infancy. I had maybe three readers at the time and they were probably all my mom, just in different devices! So now that at least four or five of you are kind enough to stop by on a regular basis, I thought I should share it again so none of you miss out on the deliciousness! MiMi made it that first time. One of my sisters had suggested a girls night at MiMi's so all three of us sisters, MiMi and Grandma got together for a midweek fiesta. We had taquitos, guacamole and margaritas followed by these delicious fried ice cream bars. They are the stuff of dreams. 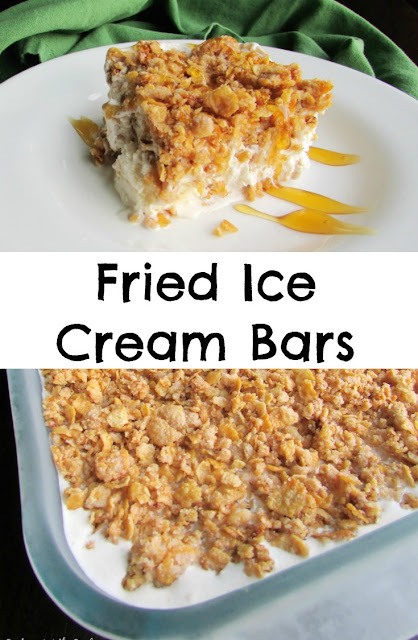 Since then every time somebody mentions fried ice cream, I tell them about these. I know at least a few of them have tried the recipe and loved it as well. So with Mexican Recipe week coming up, I knew this recipe needed to see the light of day again. I offered to bring dessert to a family dinner and got the ingredients together. Little dude mixed together the filling while I caramelized the corn flakes. In a matter of a few minutes, it was headed to the freezer. I LOOOOOVE how easy this is. You get the crunch and flavor of fried ice cream with none of the mess of frying. Plus you have the added bonus of being able to make them well in advance and serve when you are ready. Try doing that with the real deal! Anyway, my family went crazy for this. The pan was nearly decimated by the time I came home. Luckily there was still a slice or two left so I could try to update the pictures. This is definitely one you have to try! Do you celebrate Cinco de Mayo and if so how? 1. Pull out ice cream and let soften2. In a large skillet, melt butter. Add sugar and cook until butter and sugar are fully incorporated and starting to bubble.3. Stir in corn flakes and cook for another 5 minutes. You want the corn flakes to toast and caramelize a bit. Spoon about half (or slightly more than half) of the corn flakes into the bottom of a 9 x 13" pan and press to form a crust4. Mix together ice cream, whipped topping and cinnamon5. Spread ice cream mixture over corn flake crust6. 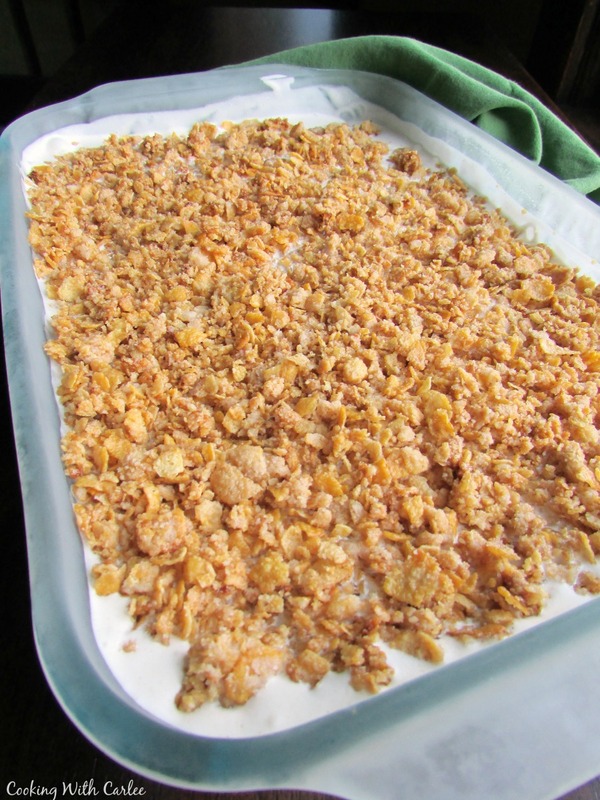 Sprinkle remaining corn flakes over the ice cream.7. Cover and freeze for a minimum of two hours.8. Slice and serve drizzled with honey or chocolate sauce. That was fun. I'm so glad Kristie suggested it. Laura's taquito recipe was a fun one to try. I love the recipes other family members have shared with your blog. It really was a lot of fun! We should have another girls' night when Chloe is back in town! I've had fried ice cream, but have never thought about making it before. This looks delicious. Stopping by from Wednesday's Wisdom. It would be great for a BBQ! A nice refreshing end to a yummy meal. Oh my goodness, it is really good! Just a hint of cinnamon and a crunch exterior all drizzled with yummy honey! MMMM! They are ;) They were a perfect end to our fiesta! Wow, this sounds heavenly! I'm an ice cream fan and must try this soon! You'll love it! Thanks for stopping by! I have never had anything like these. Sounds really yummy! Something I will have to try sometime. You have to try it, it is so good! These look and sound so good! I had a bad experience with really bad fried ice cream in a Mexican restaurant so I have to try these to see how it is really supposed to taste! Oh no! I hope these redeem fried ice cream for you, they are really tasty! Stopping by from the Home Matters Linky party! I think this is such a clever idea! Thanks for stopping by, we really enjoyed them! I haven't tried, but I think they roll it in crunchies then deep freeze it followed by a quick flash fry. Sounds messy to me! We will love your delicious Fried Ice Cream! Thanks so much for sharing with Full Plate Thursday and have a great week. It's definitely a quick and tasty dessert! See you Thursday! oh i was thinking you really fried it and I was thinking hmmmm but OMG this recipe sounds totally DELISH!! I cannot wait to give this a try and I think it will be a fav. I love cinnamon in ice cream - adds such great flavor and adding the crust.....drool! The corn flakes still have a really nice crunch, so you won't miss the fry! I love the subtle cinnamon and the honey together. So good! Thank you! This came together easy and tasted so good! It is definitely worth a try. Thank you so much! This is definitely a keeper! Have a great weekend. Carlee, I think I just want to come and live at your house - have you thought about a BB for one, lol!! Seriously, your food just wows me and this is no exception! We would have so much fun together!! Just imagine the things we could cook. I keep thinking it would be fun to have a "retreat" weekend with a few of my favorite bloggers and we could cook and gab and have fun! You would certainly have to come! I cannot even tell you how happy you made me by showcasing this fine recipe again....so yummy sounding, one of those, I want it now kind of thing! Happy weekend friend!! I want it now too! It didn't survive 24 hours after we cut the first piece, so I didn't have a chance to savor it properly! Oh well, there's always the next batch! Doing these in bar form is brilliant! I love that you went for the real deal, but these are easy and are a great make ahead. Both are great when I'm trying to feed the crowd at family dinner! Thanks, Jolene! I love this non fried fried ice cream idea. Thanks so much for sharing. It makes it much more foolproof, which is exactly what I need! Thanks, Wendy! What a fun treat to pull out for a party! These bars sounds so delicious! I don't know if I've ever had fried ice cream so I love that I can experience it without the work :). Happy Cinco de Mayo! Thank you! I am not an experienced fry cook, so the idea of making the real deal at home is the stuff of nightmares! This way is definitely more my speed and skill level! Happy Cinco de Mayo! This is awesome. So much easier than the traditional Fried Ice Cream. Can't wait to try it this summer. I don't ever fry at home, so starting with ice cream would scare me to death! This way is much more my speed and it is so popular with my family I can't imagine doing it any other way! I hope your gang enjoys it too! You've had me craving Fried Ice Cream ever since this I saw this when I was scrolling through FB at work today. Oops, did I just admit to being on facebook at work? lol!! Ha! That would never happen! I hope you give this a try sometime, it is definitely a popular one around here. 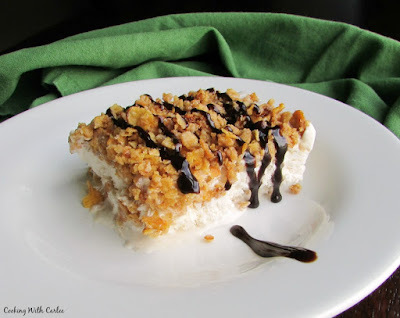 Hi Carlee, love the twist on this; fried ice cream without the frying! Perfect for anyone who hates frying. We don't celebrate Cinco de Mayo, in fact I'm not even sure what it's all about, but if a celebration can inspire people to come together and enjoy tasty food I love it regardless! This fried ice cream sounds delicious and so easy to make. I think that I am going to have to try it. It sounds wonderful on a hot day like today. You definitely have to give it a go. It is so easy to make and one of our absolute favorites!